More than 300 SEIU Healthcare members working in the long-term care sector rallied for resident care at the Ontario Long Term Care Association’s annual conference, which was held at The Toronto Congress Centre. The rally took place on the first morning during SEIU Healthcare’s Central Long-term Care Bargaining Conference at the Hilton Toronto Airport from April 2 to April 3, 2019. SEIU Healthcare President Sharleen Stewart and Secretary Treasurer Tyler Downey led our marching members through the secured doors to face over 1,200 delegates from many of the major long-term care corporations. The loud roars of the crowd, clappers, whistles, and drums gained everyone’s attention! United we chanted, “Together we rise for resident care”! 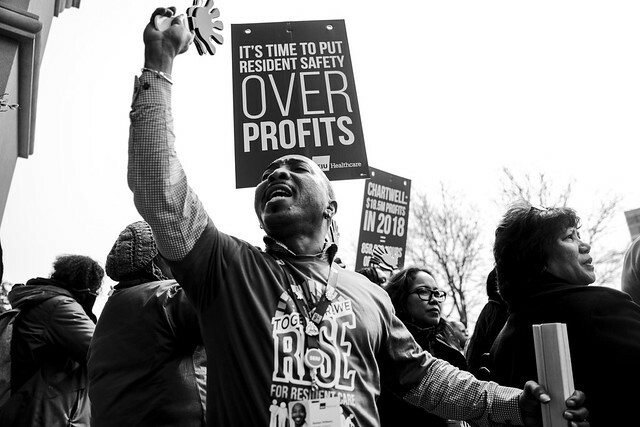 The rally informed CEOs and executives that frontline healthcare workers are too often working short, overworked, and lacking necessary equipment and resources. These issues can affect their ability to provide quality resident care. Following the rally, during the afternoon of April 2, the voting process occurred to elect the 2019 central bargaining committee. We heard from more than 40 candidates regarding why they would be a good representative on the committee. Only 15 members would be elected, and two nursing seats would be selected. After the speeches, every member voted electronically for their regional representative and then for the representative from their nursing home’s chain (Chartwell, Rykka, Revera, Sienna, Extendicare, Standalone full-time, standalone part-time). The night was followed by dinner and dancing. On the second day, April 3, the elected and selected committee members were announced! Members also participated in breakout sessions on mobilizing training regarding how to effectively lead and participate in workplace actions. The bargaining committee is now ready to head to the table to negotiate a new fair and just collective agreement that will reflect important changes needed for all frontline workers in long-term care. Please stay tuned for the introduction of the long-term care bargaining committee that will be posted shortly.